Just when you thought 4K displays were cutting edge, VESA has published the specifications for version 1.4a of Embedded DisplayPort (eDP), which enables 8K displays on smartphones, tablets, laptops, and even all-in-one computers. Among other things, eDP 14.a also features Display Stream Compression (DSC), which compresses the output video signal. Apparently, the compression will be “visually lossless,” so consumers will not notice any loss of visual fidelity. DSC is also said to be able to reduce the cost of components and power consumption of high-resolution displays. Gamers will also benefit from this latest version of eDP. Version 1.4a introduces an optional support for Adaptive Sync that is said to reduce screen tearing and graphics stutter, so you can enjoy your game without much of these annoying nuisances. However, as it is an optional feature, it will probably make its way to more premium devices only. The introduction eDP 14.a is simply one of the first steps to the eventual reality of 8K displays. 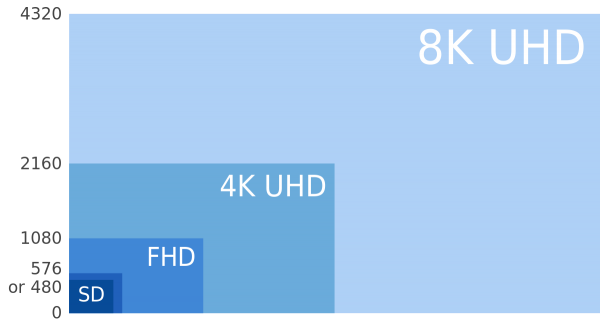 On top of that, it’s hard to justify even 4K displays at this point in time. Until displays GPUs are able to handle the requirements of an 8K display, we might not see it any time soon.